My little guy does not have any friends. J___ will be 9 in Aug. He doesn't like sports, he's had a few rough experiences trying to fit in and play ball with his peers. He is not very coordinated i.e., he cannot ride a bike yet. He would be content riding a bike with training wheels - he is not AWARE that the other kids would make fun of him. He doesn't intuitively know what may trigger other children’s ridicule. My heart breaks for him. We went to the park the other day and he tried to play with 2 other boy's his age, one of them immediately told him to “shut up”. Kids are so cruel and notice “different” immediately. I have thought about home schooling him but I just don't think I have the patience (J___ is adopted …he is my stepdaughter’s biological child). My husband and I have raised him since he was 5 months old and for J___'s protection adopted him at age 3. At his request, after starting school, he calls us Mom and Dad. He loves to watch TV - could do it all day if allowed. He used to be into video games but seems to be bored with them right now. He enjoys reading but doesn't do it???? He is constantly asking to eat! Not sure if it's boredom or what. Thankfully he has skinny genes or he'd be in trouble. I don't know what I am asking; it feels like I could type for hours. When an Aspergers (high functioning autistic) youngster doesn’t get acceptance from his peer group, parents have to find an organized way to work with him step by step to show him how to manage his daily life. One thing to consider is that many Aspergers traits often don’t reveal themselves fully until the youngster starts school, although the issues have been there since birth. So when the youngster gets to kindergarten or first grade, parents might see that he has trouble reading, doing math or processing social situations. In reality, Aspergers has been there all along—it’s just surfacing in a different, more concrete way. By the time that youngster has been diagnosed, he’s probably already developed a very cautious way of looking at the world; he may already feel different and be working hard to hide it. If you tell an Aspergers youngster, “C’mon, you’re just like the other children - don’t let it bother you,” that may make a bad problem worse because it sends a message to your youngster that he has control over whether or not he has a disorder, or the power to decide how it affects him. He’s going to walk away feeling like there’s something wrong with him, and he’s going to say to himself, “Nobody understands me, I really am different.” While Aspergers children may often learn how to manage the effects their Aspergers traits have on them, it usually takes a lot of work and effort on everybody's part—moms and dads, educators, and the children themselves—to make that happen. What is your role as a parent in this situation? One job is to balance reassurance with coaching. When talking to your youngster, remind him that a lot of other Aspergers children have gone through the same thing and made it through okay. Give him some perspective on the issue – the knowledge that this is not the end of the world. Also, in your own mind, don’t let it be the end of the world. This is the time to be a coach to your youngster. A coach reinforces and reminds children of skills that they have already acquired. A coach helps children to identify and develop the skills they need to solve a specific problem. Being a coach is one of the most precious things parents are to children. It’s a powerful thing to be able to help your youngster identify and solve his problems, because you’re giving him a tool that will aid him the rest of his life. Also, continue setting limits even if your youngster is feeling bad or down. Let him know you still expect him to carry out his responsibilities and complete his tasks. If he is upset after school, say, “Well, take a few minutes and then let’s get started with homework.” He can feel bad for a certain amount of time, but then he has to start his homework or clean his room. Don’t let him be crippled by feeling bad – and don’t treat him like he is a cripple. Limit-setting is very important during these times. You can be a loving and concerned parent, but it’s up to you to keep this problem in perspective. Your youngster may make the problem huge, so you have to be the one to say, “Yeah, that’s tough,” and then bring it down to its proper size (e.g., “It really hurts when this happens, but it happens. And even when we’re feeling this way, we still have to do our homework. We still have to talk nicely to our little brother. We still have to clean our room. We still have to eat dinner”). That way, your youngster is still being responsible and still keeping up with the tasks in his life. Affirm what’s going on in your Aspergers youngster’s life and acknowledge that it’s hard for him. You can say things like, “It must be really tough to feel like you don’t get acceptance.” And then you can move to the offer of help: “I’m going to get us some help with that. I bet you’re not the only child that doesn’t feel like he fits in. I bet there are books out there and stuff we can find online that will help us.” You’re showing positive regard to your youngster, being comforting and being helpful. Know that it’s a lot easier to start a relationship with one person than trying to get acceptance from a large group. When you talk with your youngster, tell him to deal with other children one at a time. You can say, “How about if you start with trying to find one friend first? Is there anyone at school who you might like to hang out with?” Suggest peers he might not have thought about before. Teach your child to use positive self-talk. Positive self-talk is reasoning, soothing self-talk that helps you stay calm and keep your perspective. 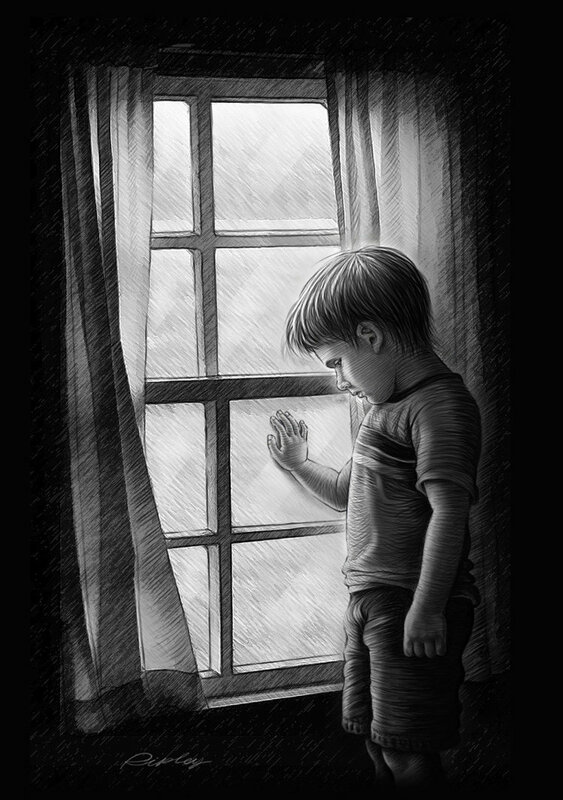 Children get anxious when they’re feeling left out or being picked on. Their adrenaline starts to pump, they think less clearly, and they panic. Positive, soothing self-talk is meant to bring them back down. In other words, it calms down their internal physical system, and accordingly, their thoughts. Let your youngster know that help is out there, and that he doesn’t have to go it alone. If you freak out and start to panic about your youngster not “fitting in,” he’s going to think you think he’s a freak, too. So, it’s very important when children share their feelings of being different for you to remain calm. Often it’s very comforting for children to hear things like, “That happened to me when I was a child, and I know how much it hurts.” They feel comforted when you identify with their problem and empathize with them. Another way of doing that is to say, “That must feel awful for you.” That’s framing it for them and empathizing with them at the same time. Remember, one of the best things you can ever ask your youngster is, “What would be helpful for you right now?” And then respect his need for space. See if your youngster can find friends outside of school, in other circles, or places where they might meet other children with the same interests. Your youngster can join things like the Boy Scouts, where the uniform basically levels the playing field (everybody in the room has the same shirt on, so children stand out less in that crowd). Teach children how to read social situations. So if there’s a group of children that doesn’t like your youngster or picks on him, your youngster needs to learn how to stay away from them and find other children who he gets along with. Maybe there are some shy children he can befriend or other children having a hard time. For some kids, reading social situations is more difficult than for others. But there are tools that can help moms and dads work with their children that will teach them how to read expressions and pick up on social cues. Let your youngster “talk it out” — don’t try to make the problem seem like it’s not important, because in your youngster’s life, it’s huge. Yes, all children go through this. But maybe all children don’t go through what your child is going through. When your youngster goes to school and gets picked on, you feel powerless as a parent. It frightens you and makes you angry, but really it’s a sense of powerlessness that you’re experiencing. You do everything you can to protect yourself in life, but when your youngster goes to school and gets hurt, you’re vulnerable too. The feeling of powerlessness is a personal feeling – and it’s a devastating one. Many moms and dads lose their objectivity when their youngster talks to them about being excluded, picked on or bullied. The technique for the parent here is to go take five minutes and calm down, talk it through with others if you can, work it out, but don’t overreact in front of your youngster. Sure, it’s very normal for moms and dads to feel powerless, and it’s very difficult for them not to overreact to that feeling. But know that when you feel powerless, your first response is not always the best response. In fact, there are generally two kinds of reactions when people feel powerless: (1) they stick their head in the sand, or (2) they strike out. Remember that neither one is helpful to a child! • Anonymous said... As a parent of an ASD son I can relate. Sports (team related do not usually work) for individual participation do seem to work. My son liked golf he did learn to ride a bun early due to his obsession with wheels. Don't give up finding the activities that he can learn to excel in, they are out there. The social interaction is the hardest, the ideals listed above are excellent. • Anonymous said... As the years go on my son started with one friend, then in high school he gained a few more. You just have to let him find the people he clicks with on his own. • Anonymous said... I can relate with so much of this article and comments from others. My son is 11 and has not been officially diagnosed but I see so much of all the comments others shared in my son... He has only been riding a bike for about a year and a half, not real coordinated, but the social area is where I really see his differences even though he don't seem to notice it. Great article. • Anonymous said... I purposely seek out friends for my son (usually younger siblings of his sister's friends) who are at least 2-3 years younger than he is. They are nicer, more accepting, and don't seem to mind quirks as much. • Anonymous said... My son has made friends with the other ASD kids that we have meet in social groups, speech, ot and special needs activities. He has more friends than his NT brother and I have made some wonderful friends with the moms. • Anonymous said... Really great insight. We use a lot of these suggestions & it does help. Go with his interests. Sports are really difficult for most kids with Aspergers. Follow their interest....for our son it's art, and they'll have a better chance at finding a more like minded kid that is accepting of & "gets" them. It is so hard to see their pain & feel powerless to help at times. • Anonymous said... We have put our son in Cub Scouts, karate, and swimming. All individual activities but still has a social piece. This was an excellent answer and I have a child with the same issue. My ds is 9 and although he gets along with peers at school most of the time, he has only one or two friends who are true "friends", i.e. children who reciprocate and enjoy his friendship. One friend's parent has a nephew with Asperger's and is an elementary school teacher, so we are very lucky, in that she encourages her son to accept my ds for who he is. A couple of things that have helped for us. My ds is also not coordinated at all, so we enrolled him in martial arts to help him build confidence, coordination, flexibility and discipline. Since it is not a team sport but a matter of personal improvement, the coordination issues seem to matter a lot less. Also, we bought my ds a "go-kart" type vehicle, that he can sit low in and pedal like a bicycle. His friends think it's cool and want to take turns on it, and don't mind that ds uses the pedal-kart instead of a bike to play. In addition, although children with Asperger's can understand that they are "different", they often don't understand social convention, which causes many of their social issues. We found a social skills group at a local children's hospital, where children participate in a program that is designed to take the social skills that they may intellectually know, and teach them how those skills practically work. Such a social skills group can help develop pragmatic language in a child with Asperger's, and the child gets to meet others similar to him or her at the same time. Finally, we are very open with my ds about his challenges. He knows that he has autism, and that his autism is the reason he has difficulty relating to friends. He also knows that his autism is the reason why he focuses so well on favorite activities, and is a whiz at math and science. Autism is part of him, and knowing that helps him understand himself, but doesn't excuse behavior that is inappropriate. Hallie Stollman Middlebrooks I put my Aspie into Tae Kwon Do. It's individual, energetic and he has fun even though he's not great at it. It has improved his coordination, balance, turn taking, and even his interactions with other kids. Highly recommend it! Eliza Edwards My 8 year old has a very hard time with his peers. He's very sensitive and gets confused and upset when kids want to do other things than he does. We've been playing frisbee and he loves kicking a Nerf football, but he's afraid of getting hurt. AshleyandJustin Fenton I think it bothers some of us more than it does them..my son cant maintain friendships either but im happy that hes content playing alone..sad for me but doesnt bother him..
Amanda Branton Brown This is my son and I everyday. As AshleyandJustin said, I think the problem is only *really* a problem if he expresses the interest in having friends and can't figure out why he's repeatedly unsuccessful at it. I know when I was a kid in school, I wasn't real coordinated either and didn't care for organized sports. Consequently, I got left out of a lot of social activities - being in a school where both the classmates AND the teachers put a lot of emphasis on sports. I wasn't always really happy about my situation, but I wound up "being myself" instead of catering to what OTHER people thought I should do in my free time. Eventually I made 2 or 3 friends who shared some of my interests and I was far better off playing by myself or with them than constantly trying to play sports I didn't enjoy, in a futile attempt to make friends based on false interests in common. ‎*sigh* My daughter has the same issues - she simply can't understand her peers and does not socialize well at all. Unfortunately she KNOWS she is being teased and can become very paranoid. I like the idea of individual sports - horseback riding, martial arts, fencing... you just have to find something he is OK at. It's hard when our kids aren't very coordinated, but sports can improve their muscle tone and coordination. Bridget M Venetta That is so my 8 yr old daughter. :( wish the world was a kinder place for our kiddos. I was told that after 18 no one checks your age card for peers. .such as "Hey my names Mary I am 35 but we can't eat lunch together because your 42" So we chose not to check the age card for our son we saw that he learned age appropriate skills and interacted at school. But If a great saturday was hanging out with the Profs from the university talking weather rather than playing ball so be it. As a highschoo grad he now even plays a pick up game or two! my Aspie couldn't hop or jump at all when he started Tae Kwon Do at age 5. He now -10 months later -can hop on one foot across the room and jump over obstacles. You have to find a class that knows how to deal with your child's special circumstances. My son loves earning stars and belt colors and has really grown from being in both the class and after school program at the studio. He is now going to camp at the studio - his choice. I like that he's among the younger kids there - he is modeling after the older kids (some of whom are black belts at 12, 13 yrs old). Amazing progress but I know it's probably unique to him. Michelle Rocque-Branscombe My son, who is 17, and I volunteer at a training centre for special needs people. I am amazed at the unconditional love that these people have for everyone, including my son. He knows that they care about him, accept him, and call him FRIEND. As a parent, it is an answer to many prayers. I have been a part of this group since 2001, when my son, Jeremy, was diagnosed with Asperger's Syndrome. I didn't know where to turn, what to do, how to cope. This group has been my life-line since then and was always a place I could turn to to gain information/help or just to vent. I am on the upper end of things as he just turned 19 yesterday. These years prove to have different challenges than there were in the school years. He's been given a lot of help (thanks to a WONDERFUL case manager) to gain a lot of self-advocating skills. Going to the vo-tech school and learning about graphic communications has been the answer for him. He LOVES it. He has enjoyed it and has really found his niche! It caused him to LOVE going to school for the first time in his entire life. (This was his senior year). He went back as a post-grad to finish up with the 2nd year of the class. So I just wanted to pass on this encouragement to all of you. It has NOT been an easy road to this point. School life has been a nightmare at times and until we got the OCD under control, it's been awful. We still have times where his unwillingness to so something drives me absolutely mad, but thankfully we can get through those times fairly quickly now. It has been a lot of work on both our parts, but we have made it to this point! Even though we didn't think we'd get this far, we have made every avenue possible if he chose to take it and work for it. I never thought he'd want to go to college. Didn't think he'd ever find anything he liked enough to do it. But he loves what he learned through graphic communications and has even impressed the teachers VERY much. So all of this is possible. May not seem like it along the way, but I hope this helps encourage all of you for your children. Wonderful article, thank you. For our son we found that using a smaller frame bike than he would normally ride and removing the pedals so that his feet are firmly planted on the ground is working. (still a work in progress tho) He can control the balance and his feet don't get caught up on the pedals. Another thing that I have done is practice yoga with him. There is even a book on yoga for children with Aspergers. This helps his balance, self confidence and with breathing techniques he is able to calm himself down in stressful situations. I know that sports are huge factor in children's lives but thankfully today there are many other options for all kids to fit in. I think we as parents have to guide them to where they are comfortable and in turn be comfortable with where they are. What about Track and Field? My daughter is 7 and has autism. She is very high functioning. In pre-K she was one of the most popular kids in class. In Kindergarten I was her teacher at a small private Christian school so she was not left out. Last year we spent 9 months in a suburb of Dallas while I had spinal cord surgery and went through the healing process. She was bullied really badly and after the school ignored it, I homeschooled her for several months. This year she is in the public school in our small town in Montana. She goes to school with friends from church, people we know in the community, and others. I can tell you she still feels different and "weird" but she has 11 close friends she plays with. This is because her teacher and the administration at our school take a very pro-active approach, not just to anti-bullying, but to "friendship lessons" in school. Three times a week her teacher sends her for "friendship playtime" and she gets to choose anyone from her class to go. It's considered a privilege. It's helped her gain esteem in her class with her peers. The class discusses ways to include everyone in play and they are given awards when the teacher sees them being kind to each other. These are things that make a difference to us and the rest of the community. This article is very correct in suggestions and I appreciate the suggestions by the parents. However, as a parent of a child in the school, and as a member of our community I am not powerless to present solutions to the school administration and teacher for helping my daughter be accepted. And I can swing a pretty big hammer if I decide to. Any parent can. It is the school's responsibility to provide your child with a positive experience while he or she is in your care. Be proactive and make sure that your school is doing it's utmost to take care of your child and his or her needs as well as the other children in your school who may have needs. My daughter's therapist recommended I read "Perfect Targets Aspberger Syndrome and Bullying". I'm glad I did. It explains why children with Autism are often singled out by their peers and bullied and why no one steps in to help them, including school officials. It is worth a trip to the local library for if you have a child with Autism. I wish you all good luck with your children and your schools. Please don't take all the responsibility on yourself. Make everyone do their part.